grammar | Random moosages as I see fit. ANYHOW! I did say that the craft was more promising for this month, and it’s true. While my project was not actually a painted, patterned scarf, it did involve fabric dye and cloth-not-suitable-for-a-scarf. I received a largish square of white cloth and a 29mL jar of DecoArt ink effects (personally, I think it should be “Ink Effects” but again, it’s not my choice). And I guess this is the real link to the project. I’ve actually been looking for a good fabric paint or dye that’s suitable to use for younger children. And…I’m not sure if the ink effects product is it. What’s different about ink effects versus other dye/paint products is that it kind of is both a paint and a dye. You use it like paint and paint it onto paper. Then you can iron transfer on the design you’ve painted and it becomes part of the fabric, like a dye. You can use your design up to three times. 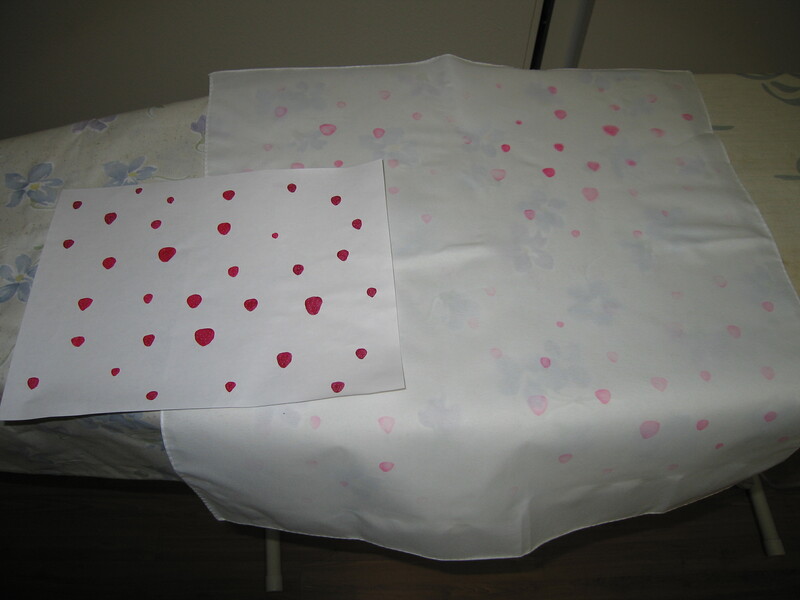 Painting on paper lets you control your design better and dying the cloth keeps the design on your cloth longer. I really like this idea. I’m having some issues trying to execute it though. So what did I do with all the materials Whimseybox gave me? Well, first off, I ended up with a bottle of PINK dye. Luck of the draw. Too bad I really dislike the color pink. Well, it might not be so much the color pink that I dislike but all the societal constructs that go with the color. It bothers me. A lot. So, it took me awhile to figure out what I was going to do with all this pink. I ended up deciding on a strawberry pattern. Strawberries are pink…ish. And I thought strawberries were more interesting than the original polka dot idea I had. So I quickly penciled out some different sized strawberries on a normal sheet of 8.5″ x 11″ paper. I decided to make them all point the same direction instead of sprinkling them haphazardly all over the paper. To make the seeds, I used a push pin and punched little holes into the strawberries. Color obviously can’t transfer if there isn’t any there. Also, it beat trying to not paint all these little spaces in the strawberries. Incidentally, Whimseybox provided me with three brushes. None of which I used. I like MY brushes, thankyouverymuch. But I can definitely use more brushes when I actually do a project with the kids. After ironing the pattern onto the cloth, I meant to put the green tops on using a fabric marker. Because remember, I only have a jar of pink. Except…the ink didn’t transfer quite like I was hoping. Looks like I’ll have to work out the kinks before working on an actual project. My first attempt, I thought maybe I had let the ink dry too long. I’ve seen instructions to let it dry between 30-45 minutes. It was actually a few days before I got to ironing the first time around. The result wasn’t even and generally didn’t transfer much by way of color. 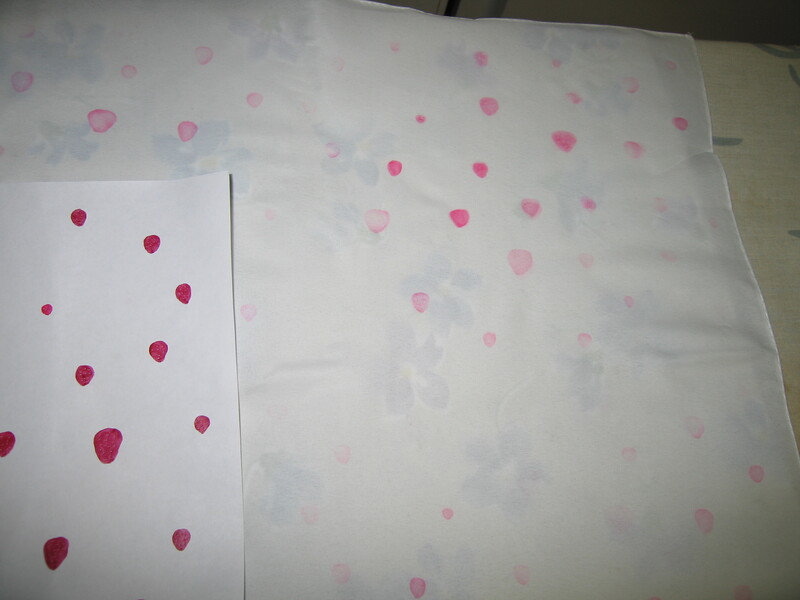 The second time, I let the ink dry for about 30 minutes and then I ironed it onto the other half of the cloth. Approximately the same results. Soooo…I’ll have to work on this. 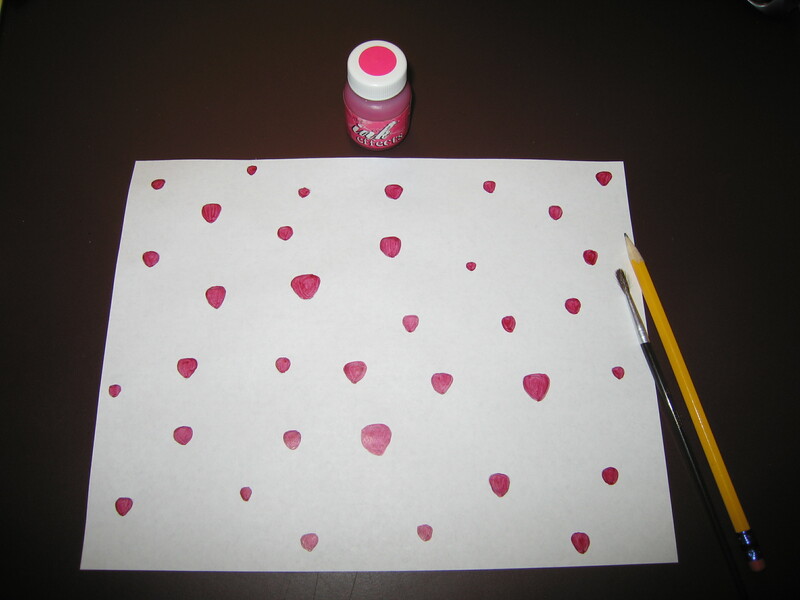 I have grand ideas for this strawberry print. Oh, FYI, they’ve dropped the price back down to 15$, which is much more reasonable. Go ahead and give Whimseybox a try. I often buy my popcorn in bulk because I’m not a fan of those fake butter microwave things. The last time I bought popcorn, the store had it in one of those sliding, chute dispensers. That’s fine—it saves me the trouble of finding a scoop—but it means that it’s highly likely that too much popcorn will come rushing out of the chute and into your bag. Which is what happened to me. And it’s not like you can put it back. That’s bad form. So…what do you do with all this popcorn? 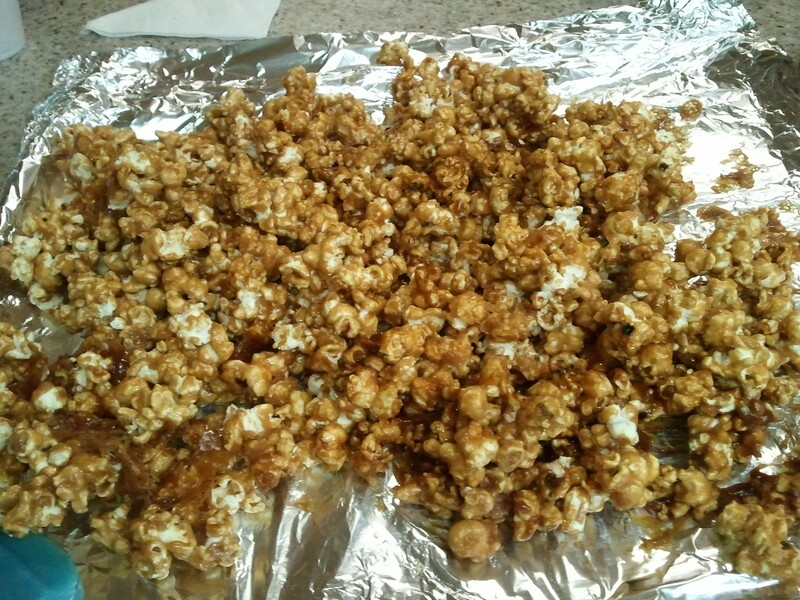 Well, make some caramel popcorn. Just remember to pick out the unpopped kernels before you dump the caramel on. Otherwise, be really careful when you eat. I don’t normally make candy (the caramel) because I have to break out the candy thermometer and it’s kind of a pain to wash afterward. Well, you don’t actually need one for this recipe. For one thing, the caramel going over popcorn. And, if the caramel ends up too soft, there’s a drying portion in the oven. It works out really well. Bring corn syrup, butter, sugar, salt to a boil, stirring constantly. Boil unstirred for about 5 min (or bring temp up to 250F if you have a candy thermometer). Take off heat, stir in baking soda and vanilla. Mixture will foam. Spread over sheet pan and bake for 1hr (this is to dry out the caramel a bit, you can do more or less depending on how brittle you want it). If you like a butterier caramel popcorn, up the butter amount. I’ve made it with a whole cup of butter before. You have to stir for a pretty long time before everything gets incorporated though. Also, a cup of butter is kind of gross. The corn syrup is there to keep the consistency of the caramel smooth. If you don’t have it, the caramel can come out grainy. I’ve been told that you can use a bit of lemon juice to the same effect. I’ve not tried it myself though. Add peanuts to make something like Cracker Jacks. Next time, I’ll try making a smaller batch in the microwave and see how it turns out. Also, I got to use an em dash! Two even! A matched set!